I made some Coffee, Pecan and Cinnamon scrolls this morning. 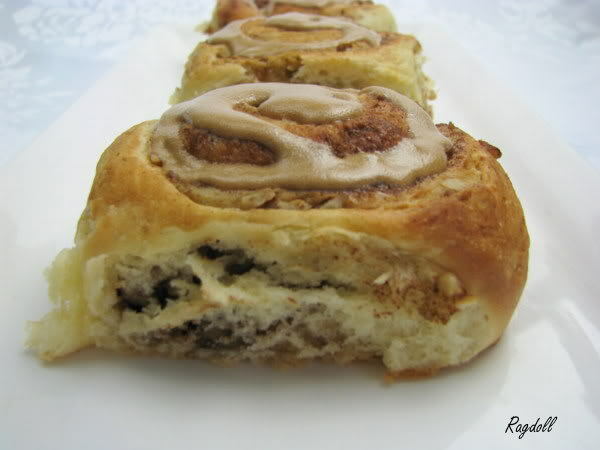 Based on the Bill Granger Cinnamon snail rolls, I just tweaked the recipe a little to incorporate coffee and pecans. 1. Dissolve the yeast in the warm water in a small bowl, and set aside until frothy. 2. Place milk and cubed butter in a saucepan over medium heat until butter is melted, leave to cool slightly. 3. Combine flour, salt and white sugar in a mixing bowl. 4. Make a well in the centre, add eggs, milk and yeast mixtures, and stir until combined. 5. Turn the dough out onto a lightly floured surface and kneed for 6-8 minutes, adding flour if dough is too sticky. Add the currants and sultanas during the last 2 minutes of kneading. 6. Place the dough into a lightly greased bowl and cover loosely with plastic wrap. Leave in a warm place until doubled in size, about 30 minutes. 7.Punch the dough down and turn out onto a lightly floured surface. Press out into a 23 x 60 cm rectangle. 8. Brush generously with the melted butter (saving some for later). Sprinkle brown sugar and cinnamon evenly over the dough. 9. Roll the dough up lengthwise to make a log. Cut into 2 cm thick slices and place on a greased baking tray. Brush the tops with the remaining butter and cover loosely to rise again, until doubled. 10. While the rolls are rising pre-heat oven to 180 C.
11. Bake the rolls for 20 – 30 minutes or until nicely golden. I made these today…. Well a variation as im not fond of cinnamon…. I used a little brown sugar and Nutella mixed with coffee & chickory essence, and chopped walnuts…. It was definitely worth the effort… Dont even know how I found your recipe, but glad I did… Oh BTW I used a coffee glaze on top too….. Devine! !